While the weather conditions have been warm and dry across the state of Colorado, recently we finally got a hint of Winter with our recent snow fall. No doubt a joyous occasion for those riding fat bikes! But for those forced to ride inside, how do you make the most of winter riding? It brings up the trainer vs roller debate, as well as, how to stay motivated to ride indoors altogether. When it comes to rollers vs the trainer, the debate is far from over as it really depends on individual preference. Both come with many different levels of resistance and accessories to fine tune the experience. For most, a trainer will have more appeal. They are good for any type of ride from casual to the all out sprint. Trainers don’t require a lot of concentration either, so the option to flip through channels on the TV, reply to email, send text messages, or take a quick break is easier. And, trainers are great for virtual training tools like Zwift. On the other hand, rollers offer some advantages too. They create more of a road-like feel than trainers do. Rollers help your cycling form as your legs spinning pattern becomes much more efficient. And, riding rollers keeps you a bit more mindful and engaged so that you don’t fall off! Some things you want to take into consideration, whether you opt for rollers or the trainer, is to set it up correctly. Having the right equipment and bike parts can make your indoor workouts less boring and more effective. When we’re talking about equipment, sure, we mean having your road bike on the trainer or rollers, but we’re also talking about having a fan, a sweat towel, a trainer mat, indoor riding clothes, a cadence sensor, a power meter, and a heart rate monitor. You might not think all of these cycling accessories add up to a great trainer workout, but it can make all the difference in the world. Make your indoor riding really count. It’s hard to stay motivated riding indoors for days in a row. So, another way to make riding indoors work is to shorten your ride. In fact, a one hour hard trainer workout will do more to improve your cycling and race fitness than 2 to 4 hours easy on the trainer. So, plan your time on the trainer or rollers accordingly. If you are living anywhere along the Front Range in Colorado, you’re living in a sea of white. Snow that is. Dreading the bicycle rainer and missing the outdoors, what are your options? Get a fat bike. You know you want it. Who doesn’t? Fat bikes were originally invented for winter trail riding and racing in sub-arctic Alaska and simultaneously, for touring the deserts of New Mexico. But they have gained severe popularity! Their utility has expanded to include all forms of cycling; they thrive in snow, sand, desert, bogs and mud as well as riding what is considered normal mountain biking. In fact, fat bikes are the fastest growing segment in the bike industry. The biggest plus in newer fat bike models is they’re getting lighter. Bike parts and fat bike tires are easier to get. And, there are more models to choose from. The best part? There are just more people out there riding fat bikes. There are races too! The 2014 – Abominable Winter Adventure Run and Fatbike Race scheduled for January 25, 2014 is held at over 10,000 feet. This fun fat bike race is an opportunity to get some fun, winter FATtire competition. around an amazing groomed terrain and a Rocky Mountain backdrop. 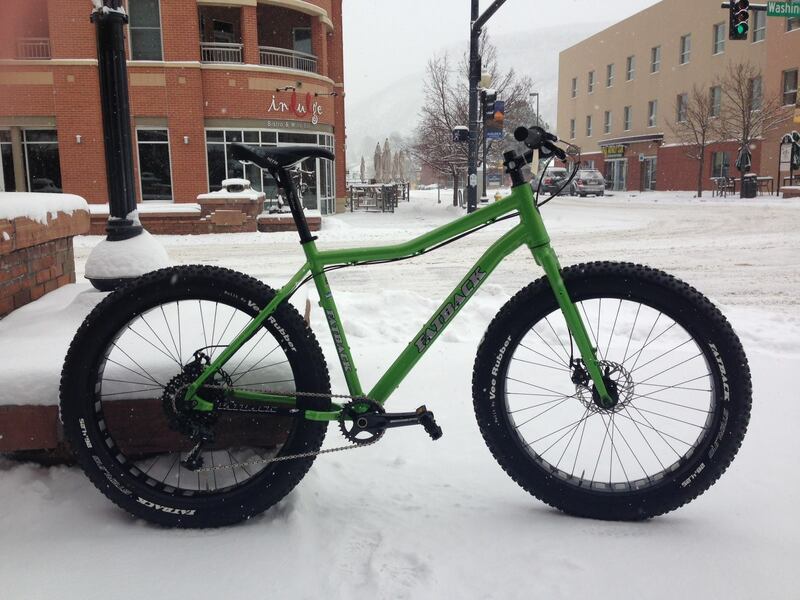 Get off the trainer and on to your new fat bike! Discover the fat bike craze for yourself! Look at it. It is waiting for you to come get it. The Fatback 190 20″ at Peak Cycles in Golden, Colorado.